Shigeru Miyamoto. Any individual that declares themselves a true video gamer should know this name. This man is responsible for bringing us the cap wearing moustachioed ‘Jumpman’, now famously known around the planet as Mario. This little mushroom-chomping, koopa-slaying, platform-conquering plumber has been the marketing face of Nintendo ever since 1985, when the first Super Mario Bros title was released packed in with the illustrious NES. The core platform format of Mario has continued ever since, with many spin-offs, making our princess-rescuing hero an undisputed video game icon. With the release of the Game Boy in 1989, it wasn’t a surprise that Mario would make the transition to handheld on the back of the success of Super Mario Bros 3. Nintendo pulled the same trick as with the NES and made Super Mario Land the Game Boy’s launch title, for the first time without Miyamoto's involvement. This made sure all who purchased it would have a familiar character to play as; but could it live up to the already high standards set by the franchise? Mario must have taken a vacation after the events of Super Mario Bros 3, as he finds himself in the realm of Sarasaland, fighting the space monster Tantanga to rescue Princess Peach’s alter-ego, Princess Daisy. This basic plot is pretty much the criterion of all Super Mario games, and the general appearance and feel of Super Mario Land is similar to that of the first Super Mario Bros, but being the Game Boy’s first Mario title, things differ slightly. Firstly, Mario appears to have left some of his trademark powers in baggage reclaim. Only his magic mushrooms and invincibility stars have made it, with his Fire Flower power turning into power balls that bounce around the screen. These have an added ability to collect the coins that are scattered about the lands he progresses through, gaining points and vital extra lives. It’s a different aspect to the gameplay from the typical fireballs that can be exploited reasonably but has annoying limitations. One fireball onscreen at a time makes for some unnecessary and irritating deaths. Secondly, and more unexpectedly, Mario takes a break from the platforms to endure a bit of scrolling shoot ‘em up action. Donning a Sky-pop or Marine-pop in certain stages, he plunders the world shooting baddies in abundance, removing his normal abilities aside from the super mushroom. This is a new feature for the franchise, and would be called upon in future games. Some dislike this veer away from the platform familiarity, but I think it adds a unique feature to the handheld version, although it is not as challenging, rather simple and has little depth. 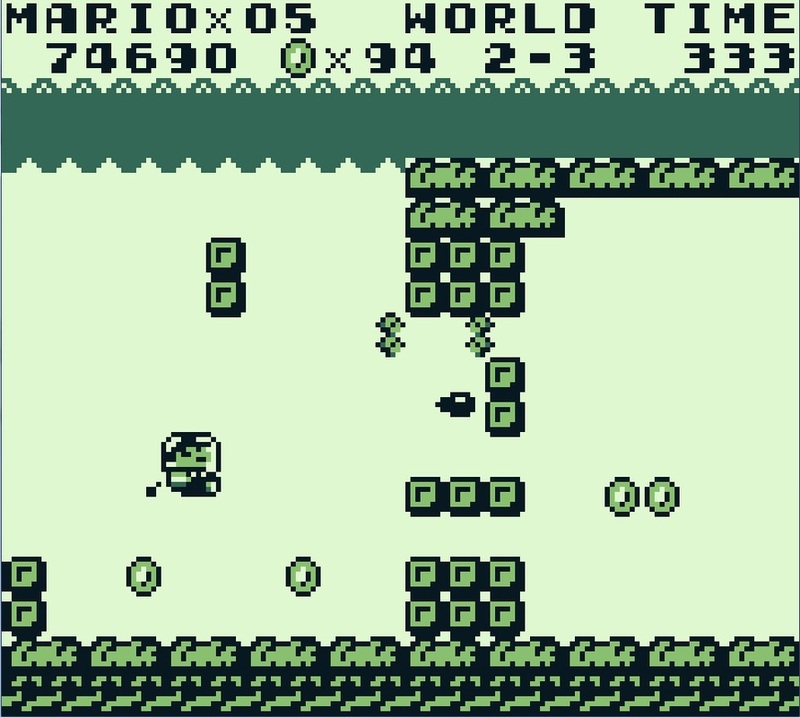 Of the four worlds consisting of three levels apiece, the platform design in terms of difficulty is excellent, progressively getting tougher as you advance into the game. 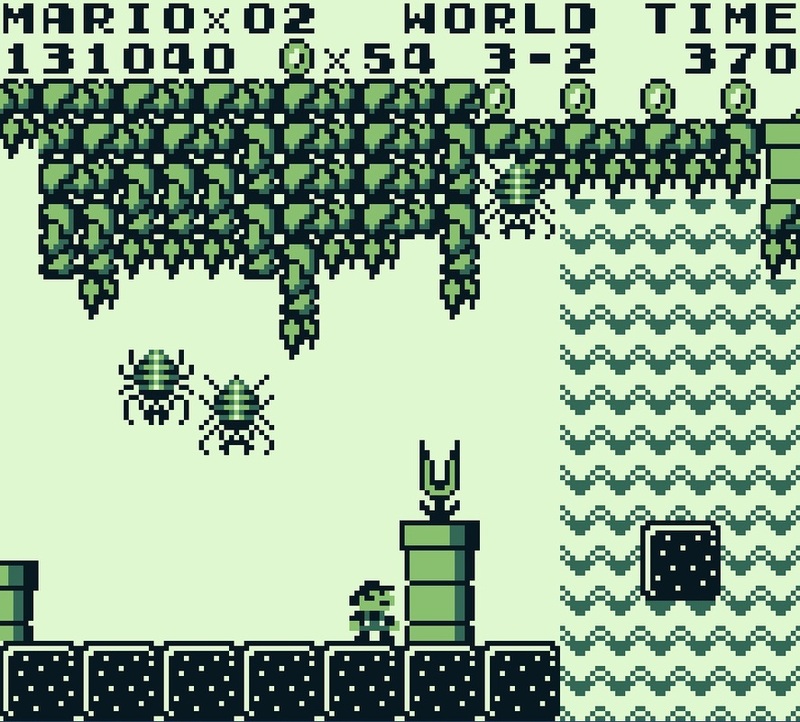 This can be said about the enemies too; with some damn hard critters popping up alongside the usual goombas and koopas, the latter providing yet another gameplay switch. Koopas now blow up after being jumped on, forcing you to avoid the resulting explosion that causes certain doom for our plucky Italian pipe-fixer. No picking-up-shell shenanigans with this Mario. These not-so-subtle changes to the gameplay make for a mixed response with me, but it does make it a different challenge from previous Mario titles, and part of that challenge comes from the way Nintendo choose to present the graphics. Although the screen space is very limited, the Mario sprite is ridiculously small, consisting of barely 50 pixels, if that. It’s amazing they actually get him to look like he should. Things get better with the super mushroom, but there are still acres of room available to utilise. 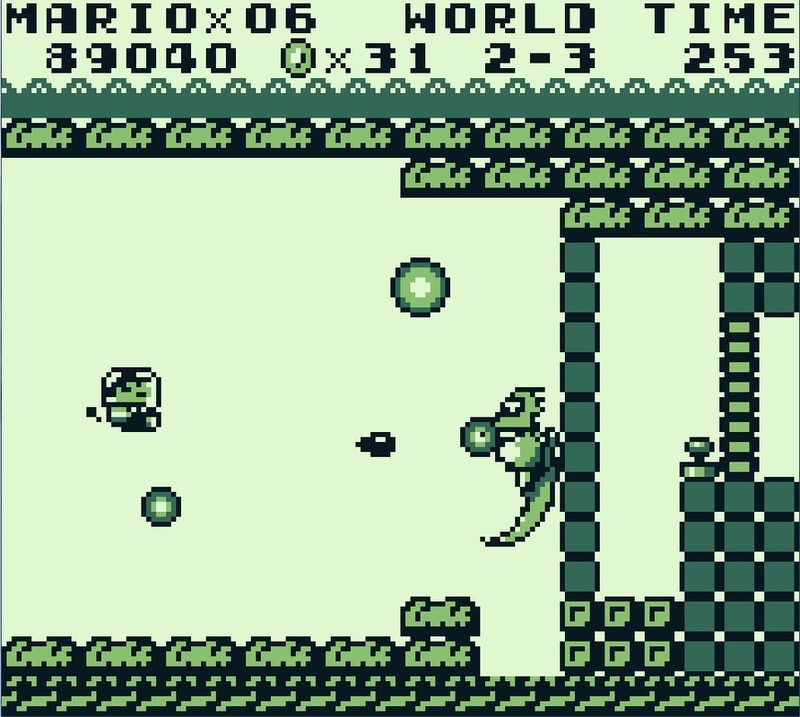 This was rectified in Super Mario Land 2, with the sprites all having a generous enlargement. Add to this the customary motion-blur of the Game Boy and things can get a little tricky to see clearly. The pace of the game is quite quick, the collision detection sharp but unforgiving, so these graphical discrepancies take their toll. These problems aside, the backgrounds are nice, clear and don’t blend into the foreground though may be a bit sparse in places, and the animation, platforms and question mark blocks are prominent and well drawn. For an early GB title, it’s a presentation that is clear and in theme, but lacks a level of detail that the classic monochrome dot-matrix look could potentially achieve. Now, hands up who bought the dance re-mix of the main theme tune by The Ambassadors of Funk? No, me neither. It was crap. However, the jolly tune makes for good listening within the game. Many of the classic Mario BGMs are memorable, and this is unquestionably one of them. The other tunes following your journey are equally as fitting and joyful, with that blippy and tinny GB sound that always brings a smile to my face, as it did with millions around the world. 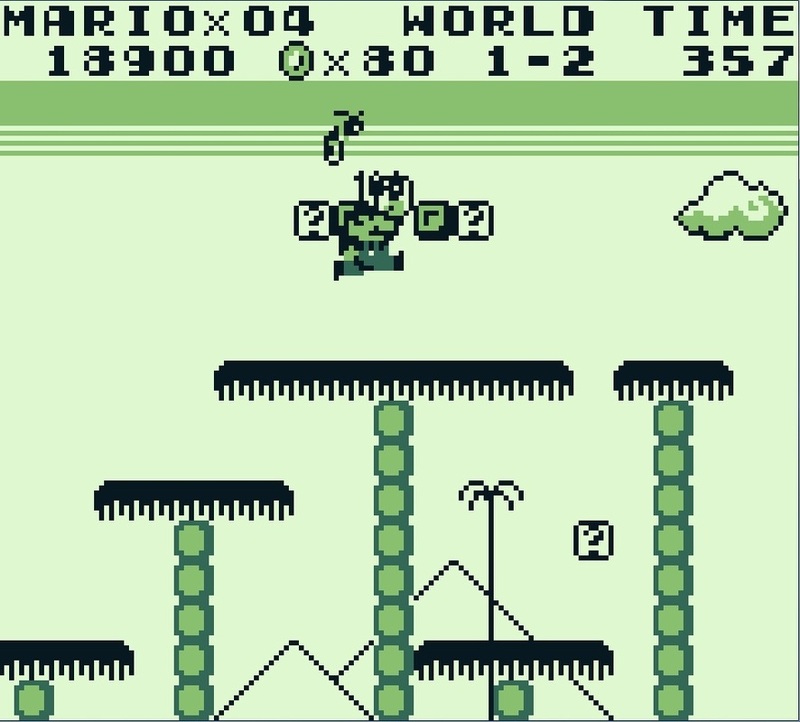 As is the norm, Mario’s jumps, power-ups, enemy hits and coin effects are all present and correct making for an audio accompaniment that has little fault to speak of. 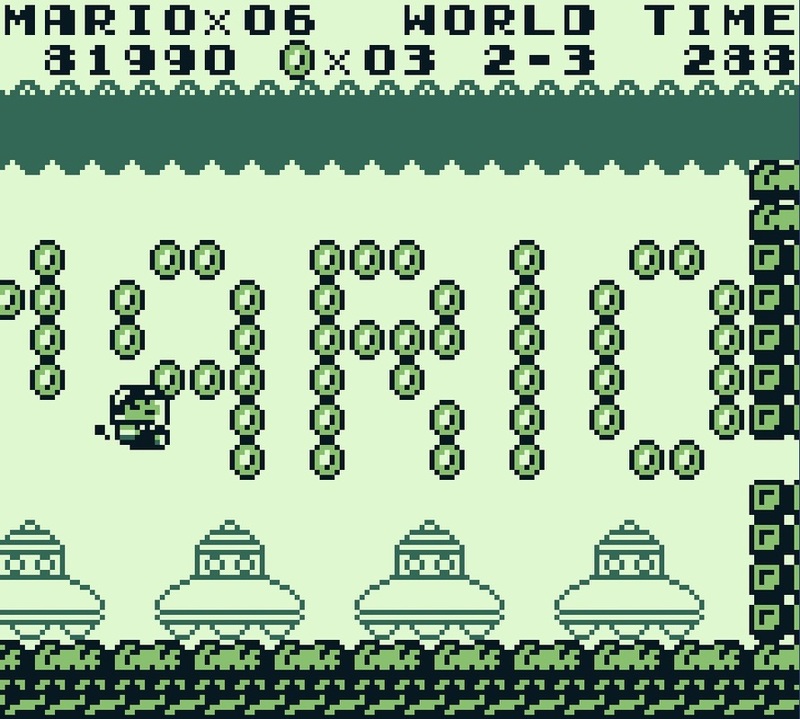 It pains me to say it, but Super Mario Land could have been the all-time great its home console ancestor was, but the alterations in gameplay and modest graphics hampers it somewhat. I played this to death back in the day, and found it also has something else absent. All the Super Mario Bros games up until Super Mario Sunshine had something that drew me back, time and time again. They were vast, tough and fun. This is an enjoyable game, but has a bit of that indescribable Mario magic missing that doesn’t put it up alongside its home console predecessors or its subsequent sequels. However, it sold in massive amounts and is still one of the best-selling games of the handheld’s library. Maybe I’m being too critical, but it was evident that the Game Boy could produce some outstanding graphics given its margins, so this could have been considerably better. The gameplay changes were hit and miss; the shooting parts providing a bit of an escape from the platform regularity is welcome, but the power up limits and generally short sized quest are not. A fine Mario jaunt, but not one of the very best.